We hope you like the addition of "ByTheYardComics" to our newsletter. 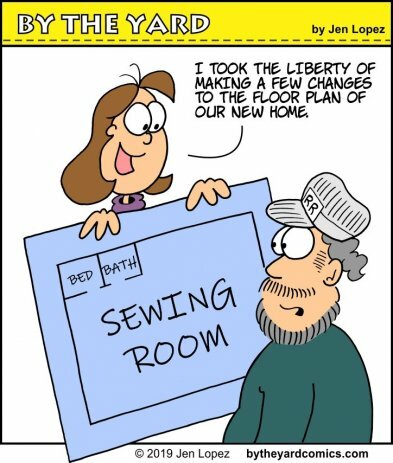 The subjects usually ring pretty true to all of us as quilters, and everyone needs a smile in their day! We sent the information (copied below) out last week about our retreat which is fast approaching - but need to add there is a deadline for signing up - 2/10/19. There are still places left, so sign up today - either call or on our website using the link below. If weather is inclement and you can't make it, we will refund the fee. Weekend Retreat Scheduled for Feb 22, 23, 24. Join us for a 3-day weekend retreat dedicated to sewing, quilting, and crafting. This is a great opportunity to step away from the distractions of daily living to focus on whatever project you have been dreaming about. Stop in at Lickety Stitch beforehand to get all the supplies you need. Pick up a new project, a kit, or the sashing and borders for those blocks you have in a stack in your sewing room! Attack those UFO's, especially the ones you need some advice or help with, as there will be experienced quilters there to advise you. We realize not everyone can stay all hours all 3 days, but come for whatever time you can. Enjoy the energy and camaraderie of our sewing community. Meals included: Friday supper, Saturday lunch and Sunday lunch and a casual smorgasbord on Saturday evening. We are holding the retreat at the Niobrara Senior Center at 611 E. 6th Street, Lusk, Wyoming. We are able to start our retreat when the Senior Center is finished with their meals and activities for the day, at 3 p.m on Friday. Irons and boards, and a cutting mat will be available to share. If you have a favorite, feel free to bring your own. Supplies to bring: sewing machine, extension cord and surge protector, standard sewing supplies, your projects! Friday evening, Feb 22, at 7 o'clock, we are planning a time for show-and-tell, demos, and games with prizes. Anyone from the community is welcome to join us for this fun hour at no charge. If you need sleeping accommodations, there are 5 motels in Lusk. Please call for recommendations. Space is limited. Call early to reserve or sign up online with this link. 307-334-9963. We will refund your reservation fee if you can't get here because of bad weather. & Sunday, February 24th 9 a.m. - 5 p.m.
We will have a challenge with “Camping” as the theme. Anyone can enter a wall-hanging, tote, or other item featuring camping into this competition. Items need to have been made in the 12 months prior to the display, and MUST BE LABELED! There will be three viewer’s choice awards for 1st Place ($75), 2nd Place ($50) and 3rd Place ($25). Quilts need to be less than 60″x60″ and submitted before April 13th (delivered to a participating shop). Application available here. Put it on your calendar and save the date - it makes a fun place to spend the day! We recently added several hundred sale fabrics for $5 and $7 per yard on LicketyStitchQuilts.com website in the sale area. We need to clear out room for all the new fabrics and collections that are constantly arriving. You can find some great fabrics among these bargains!